BUYSOUNDTRAX Records presents the original soundtrack to MEGAFORCE, featuring music composed by Jerrold Immel (DALLAS, KNOTS LANDING, HOW THE WEST WAS WON, VOYAGERS) for the 1982 camp action classic directed by Hal Needham (SMOKEY AND THE BANDIT, THE CANNONBALL RUN, HOOPER, THE VILLAIN), starring Barry Bostwick, Persis Khambatta, Michael Beck, Edward Mulhare and the great Henry Silva. MEGAFORCE reveals to the world the existence of �a phantom army of super-elite fighting men whose weapons are the most powerful science can devise�. Led by Commander Ace Hunter (Bostwick), MEGAFORCE is a special rapid deployment unit consisting of specialists from armies across the world, using the latest in military hardware, combined with the latest advances in scientific technology, ready to strike at a moment�s notice. The film is concerned with the fate of the peace-loving Middle Eastern republic of Sardun, under constant siege by its aggressive neighbor Gamibia. Unwilling to retaliate, Sardunian military officials General Byrne-White (Mulhare) and Major Zara seek out MEGAFORCE to help put a stop to Gamibia�s incursions. Ace is happy to oblige the Sardunians as he has a past with the leader of Gamibia�s military, Duke Guerrera (Silva), an old military friend who decided to stop fighting for causes and now fights for the money. After MEGAFORCE deploys at night and successfully infiltrates Gamibia, they find themselves without support from the Sardun government and unable to trap Guerrera. The team must now fight their way through Guerrera�s army of tanks to get to their extraction zone in time to be picked up. If they don�t get there in time, there will be no other way to get out of Gamibia. MEGAFORCE arrives at the extraction zone, a dry lake bed, to find Guerrera and his men waiting for them. Ace orders his men to engage Guerrera, as MEGAFORCE focuses its full military might consisting of rockets, lasers and machine guns mounted on motorcycles and ATVs against Guerrera�s tanks in a desperate bid to break the blockade and make it to their extraction planes. Ace defiantly turns around to say goodbye to his old friend one last time. With the last plane in the air, Ace decides to field test the latest upgrade to MEGAFORCE and his motorcycle takes flight, allowing him to escape and catch up to the rest of the team. 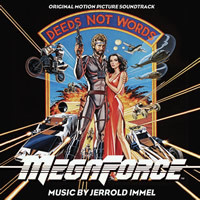 The music for MEGAFORCE was composed by American composer Jerrold Immel, best known for his work on television shows such as DALLAS, KNOTS LANDING, VOYAGERS and HOW THE WEST WAS WON. Producer Albert S. Ruddy had a relationship with the composer already from his work on HOW THE WEST WAS WON and when Ruddy became part of MEGAFORCE, he brought Immel in with him. 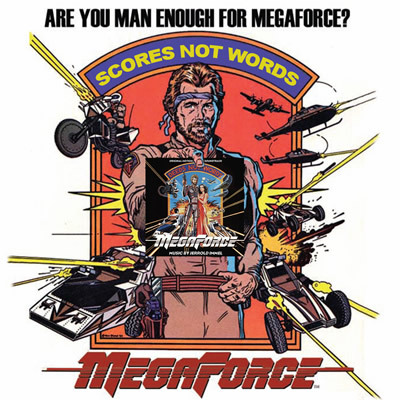 His score for MEGAFORCE is a remarkable blend of live orchestra with electronic instruments, something that had not been done very often at that time. Most scores in 1982 were largely either all-electronic scores or all-orchestral scores, rarely were they integrated. For the electronic elements of the score, Immel worked with Craig Huxley, a noted synthesist responsible for creating the Blaster Beam, the ultra low frequency instrument used to create unique electronic sounds for films such as METEOR and STAR TREK: THE MOTION PICTURE. At the time of the film�s release, the composer had put together an album presentation of his music. Because the film did not do well at the box office, an album was never released. BUYSOUNDTRAX is excited to release this presentation on compact disc, which includes music written for the film but was not used, such as the end title suite. The producers chose to end the film with a song by the rock band 707 and it is not included on this release. While much of the dynamics of the composer�s final mixes were lost in the film�s soundtrack, which gave equal weight to the battle sequences and the roaring engines of the vehicles, this unique mixture of electronics and orchestra can now be appreciated on this recording. Are YOU man enough to JOIN Megaforce?